An American artistic legend established in 1880, by Maria Longworth Nicholas, Rookwood Pottery is an American pottery Company that has gained a formidable reputation as one of the finest in the world. In 1889 Rookwood surprised the ceramics community when it was awarded a Gold medal at the Exposition Universelle in Paris. The award changed the way the international ceramics community viewed American ceramic art. In 1900 Rookwood became the name associated with excellence and brilliance in architectural ceramic design. Increased interest in American art and crafts made it a popular choice for architects and interior designers. In 1902 Rookwood added architectural faience wares to its range. It was run by William Watts Taylor and rapidly became a popular choice for those architects and interior designers. As demand increased Rookwood Faience added fire surrounds, mantelpieces, wall plaques, statues, fountains and garden furniture to its range. Rookwood also decorated hotels, museums and Grand Central Station. Several subway stations in New York feature Rookwood tile designs. The earliest Rookwood pieces are relief worked on coloured clay, either in red, pinks, greys, sage or olive greens. The next Rookwood period has a standard glaze. 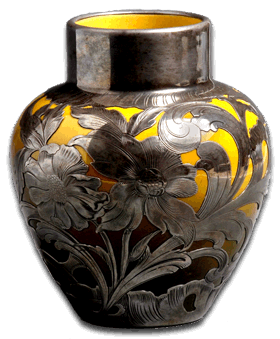 A yellow tinted, high gloss clear glaze often used over leaf or flower motifs. 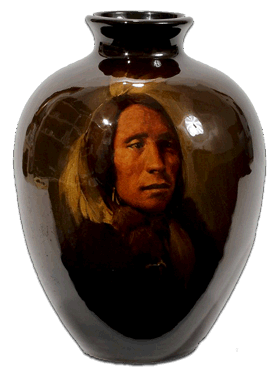 A series of portraits, often of American Indians or historical figures was produced using the standard glaze. A popular variation on the standard glaze is the very collectible tiger eye which appears only on a red clay base. Before Rookwood Pottery American ceramic art was decades behind the rest of the world. Maria Longworth Nicholas, was the daughter of wealthy art collector, she was inspired by Japanese pottery. When she discussed her desire to create fine pottery with her father, he provided the means and environment that allowed her to pursue her creative passions. And although it may have started as a hobby, the talented Maria quickly managed to establish Rookwood pottery as a quality producer of fine ceramic art. A Rookwood piece by Japanese artist Kitaro Shirayamadani sold for $198,000 in 1991. He worked for Rookwood Pottery from 1887 until 1948. She setup the Rookwood company, hired artists like Japanese artist Kitaro Shirayamadani who came to work for the company in 1887, and talented art students and encouraged them to use their creativity to experiment and create unique pottery pieces. Almost every piece designed by these artists sold for hundreds of dollars, and today they are regarded as highly collectible. 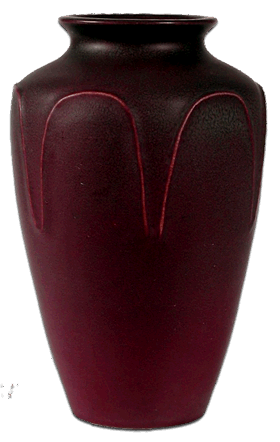 The Rookwood airbrush, called the mouth atomizer, was developed by Rookwood to apply glazes in an innovative way. The technique helped the company develop its own individual look. The atomizer helped add the beautiful layers of colour Rookwood is known for, and the technique is still used at the Rookwood pottery today. Rookwood Pottery was the first pottery manufacturer headed by a woman. More well known pottery manufacturers and recognised artists doubted this female led company would have what it takes to succeed, but much to their surprise Rookwood turned out to be one of the best. By combining extraordinary attention to detail and innovative design Maria Longworth Nicholas made Rookwood the standard for ceramic pottery manufacturers to aim for. Today antique and vintage Rookwood Pottery can easily command high prices and individual piece can rank alongside the best pottery Europe can produce. Antique and vintage Rookwood pottery is definitely worth collecting. Rookwood has tradition, design innovation and a long history of 130 years behind it. This relatively long history, in American terms, and being an original American art work can add substantial value to antique Rookwood pottery pieces. But the company hasn’t always had a smooth ride. 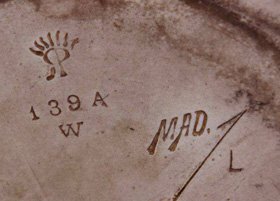 Rookwood marked their pottery from the outset and the rookwood marks have remained pretty consistent. 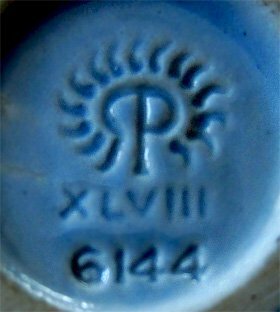 Earlier marks, like the sample at top left below, show the typical reversed R with the P logo and a small selection of four flame marks above. This dates the mark to circa 1890. Rookwood Pottery from c1900 has fourteen flames surrounding the Rookwood trademark. 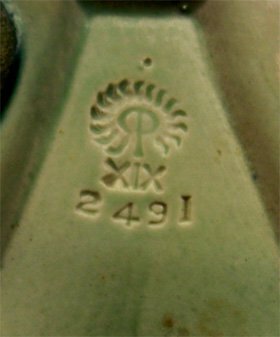 The reversed R and P logo was used on almost every piece of Rookwood pottery produced between 1886 and the end of production in 1967. Between 1886 and 1900 one additional flame was added to the logo for each year. In 1901, Rookwood stopped adding flames to the logo and started adding roman numerals below the fourteen flame mark. This continued until the end of production in 1967. Rookwood also added a shape number and Rookwood pottery can be found with shape numbers ranging from 1 to 7301. Each Rookwood mark will have the shape number impressed below the logo and shapes would be produced in multiple sizes, which include the letters A, B, C, D, E & F.
A for the largest shape size and F for the smallest. Rookwood size letters, if present were impressed right after the shape number. Glaze notations are also used on some Rookwood pieces, were V is for vellum glazes, W for iris glazes and SG for sea green, etc. 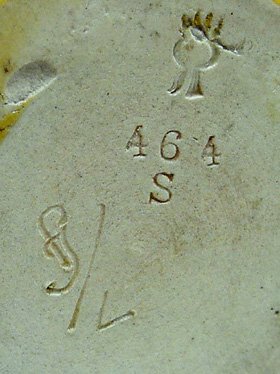 Artist decorated Rookwood pottery will have similar markings with the addition of an artists initials or cypher. 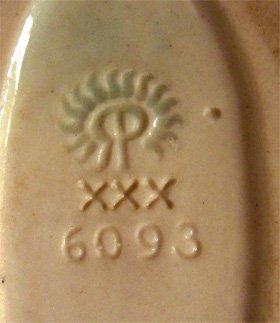 The image above left shows Rookwood marks for c1893, with shape number 139 in size A, decorated in iris glaze and by Matt Daly. Based at 1920 Race Street, Cincinnati, OH 45202 and producing top quality pottery, including the Rookwood Heritage Collection, the Classic Collection and the timeless Beauty Collection. The Rookwood collections contain everything from the past and are all made from original designs from the 1900s. Rookwood Pottery is still producing ceramics, particularly tiles, of the highest quality and with the same true artistic talent that sets antique and collectible Rookwood Pottery as one to watch out for.